Wooden bowls for sale by Terry Vaughan. Great gifts for any occasion. I make wooden bowls for sale. Please scroll down the page to see and buy my work. A bowl reveals the beauty in a piece of wood better than any other shape. Bowls supplement traditional or contemporary decor in any home. But a bowl is not just decorative, it’s always useful around the house. Small bowls can hold food, such as peanuts or sweets for sharing. They can hold keys and change, or those odds and ends that you never know what to do with. Larger ones can hold fruit or salad. Or they can just sit on a shelf or table where they can be seen as art objects. They are always welcome, and make great gifts. Every piece of wood is different, and the challenge of getting the best from it is something I enjoy. No two of my wooden bowls for sale are ever alike, so when one is sold, there won’t be another quite the same. It may be the beauty of their grain and colour that appeal, or their elegant and practical shapes. I hope you enjoy giving them as much as I enjoy making them. Most bowls here that are big enough can be used to hold fruit. When choosing a fruit bowl, look at its shape to be sure it will be stable. I use the most attractive timber I can find when making wooden bowls for sale. Sometimes it has natural features that make a bowl unsuitable for moist food. For this purpose, the inner surface of any bowl should be free of significant natural defects. 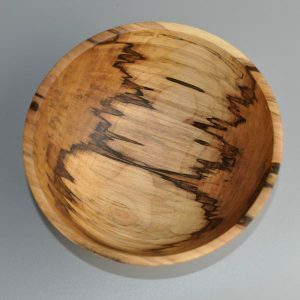 Wooden bowls with burr figure, retained bark or heavy spalting could be fine for fruit or other dry food, but may be hard to clean, or may not stand up well to frequent washing. Almost any of my wooden bowls for sale could be used for nuts or wrapped sweets. Yew and laburnum are colourful timbers that make beautiful bowls, but their seeds are toxic. Although the food-safe finish I use seals the surface of the wood, these timbers are perhaps not advisable for use in contact with moist food. It could absorb traces of the toxins if they are also present in the wood. If you entertain a lot, or have a large family, a big salad bowl is a useful thing. But if you are catering for just two or three people, or bringing different salad recipes to the table, smaller ones are useful too. Wooden salad bowls are attractive and good to use, but do need looking after. Here is some information about wood care. Handmade salad bowls are great decorative items in their own right, good for dressing a table or display on a kitchen shelf. They look even better when holding a nice fresh salad! They make great gifts. Both Sarah and I want to send you our enormous thanks for the absolutely stunning bowls and pears you made for us. You will remember that we lost the very ancient pear tree that had stood in our garden for decades. We wanted to remember the one that had gone so I brought you over a car full of large pieces from the tree. We had to wait for the wood to dry out and be ready for you to work on. But the wait was worth it. Not only did you make us a selection of various size bowls but you made four of the most exquisite pears. The largest of the bowls complete with the 4 pears is and always has been in pride of place in our sitting room. We often look at it and delight in both the memory and the feel of the pieces in our hands. You saved it for us so a piece of my childhood will forever remain with me. Wood is beautiful, the tree was beautiful and it is still with us thanks to your love of wood, your skill and your care. You are quite rightly very proud of your work and your workshop, I was so grateful that you gave the time to not only show it to me but let me have a go too! So thanks again, Terry.